The second in Nancy J. Parra’s Sonoma Wine Country mysteries is sure to make fans of Ellen Crosby heady with delight. A complex mystery designed to delight the palate of wine and cozy mystery enthusiasts alike, Seven Deadly Zins is the second quirky installment in Nancy J. Parra’s Sonoma Wine Country mysteries. 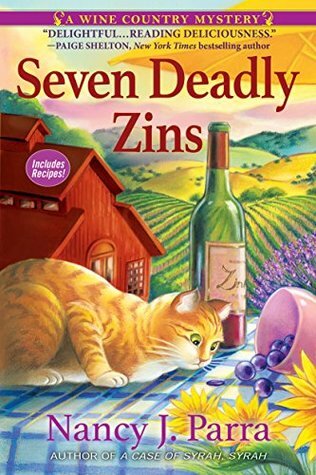 Seven Deadly Zins by Nancy J. Parra is the second book in the cozy A Wine Country Mystery series. Each book of the series has it’s own murder mystery to be solved so they don’t necessarily need to be read in order, however, the character building does carry over from book to book. Taylor O’Brian had moved to Sonoma to live with her Aunt Jemma on her aunt’s small winery when her health came into question. Even though her aunt owned the winery Taylor had wanted to make her own way so she decided to cash in on the local scenery and bought an old VW bus much like the famous Mystery Machine and planned to start up Taylor’s Off The Beaten Path Wine Tours. Taylor was just getting settled into her home at the winery and her new business when a fellow winery owner and friend asks Taylor to include his property on her upcoming tours. Taylor was happy to oblige until she brings a group for a tour and along with the wine in the vat they find a dead body. The A Wine Country Mystery series is one that has a quirky and cute vibe to it which I actually love. The characters and setting are both quite nice and I suppose you could add a touch of paranormal to the description with Aunt Jemma hosting seances. The thing with this one to me though was the author was trying to spread the focus of the story around a bit which in the end to me made the outcome more obvious leaving me to rate this edition 3.5 stars. I’ll still be on board another trip to Sonoma when the series continues though. Nancy J. Parra, also known as Nancy Coco, is the author of the Perfect Proposals mysteries, and the Baker’s Treat mysteries. 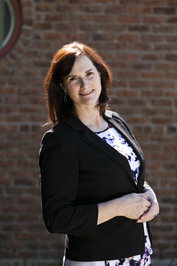 Her writing has been praised as witty and her protagonists plucky by reviewers around the world. She lives in Oregon with her trusty Bichon-Poo. Nancy is a member of Sisters in Crime, Mystery Writers of America, writes for the Killer Character Blog on the eighth of every month and loves to hear from readers. They do have some of the best covers, always so cute and screaming readme readme!! Looks pretty cute, even if it’s not your favorite!! !